This jacket does run small. It is a very pretty jacket. Bought it for my Son. This attractive lambskin leather bomber jacket features functional bellowed pockets at the both the sides and chest. A sleek black color and stand collar with shoulder epaulates finish this stylish men's jacket. The approximate length from the top center back to the hem is 28 inches. The measurement was taken from a size 2XL. Beautiful, absolutely beautiful. I've owned leather jackets in the past, but none compare to this one. It's hard to describe what the leather feels like, the best description I can come up with it "silky butter" and So Soft. Plenty of pockets, the only negative is that I feel the inside pocket could be just a little bigger. Everywhere you look on this jacket you see quality touches. When it came UPS, each button was individually wrapped.....My only regret is that Spring was too short and now it's too warm to wear it much now. You will LOVE this jacket. The jacket is definitely one of high quality and the price on this site is the lowest you will find for this jacket. The leather is simply beautiful and my wife loves how it looks on me/I'm always receiving compliments on the appearance of it. Definitely get one size up from your normal jacket/coat size. A 4XL is equivalent to a 50/52 suit size. I'm 6'1 and 225, and the 4XL is a GREAT fit. When I got the box I figured there was no way I had gotten the bomber jacket I had ordered. The box looked to be about 1/2 the size needed. I was pleasantly surprised when I opened it and there was a beautiful leather jacket inside. It was very carefully wrapped, every single button was wrapped in tissue paper, as was the zipper pull so no damage could be done. There was a layer of cardboard added above and below the jacket in case someone cut the tape with a knife to prevent nicks. 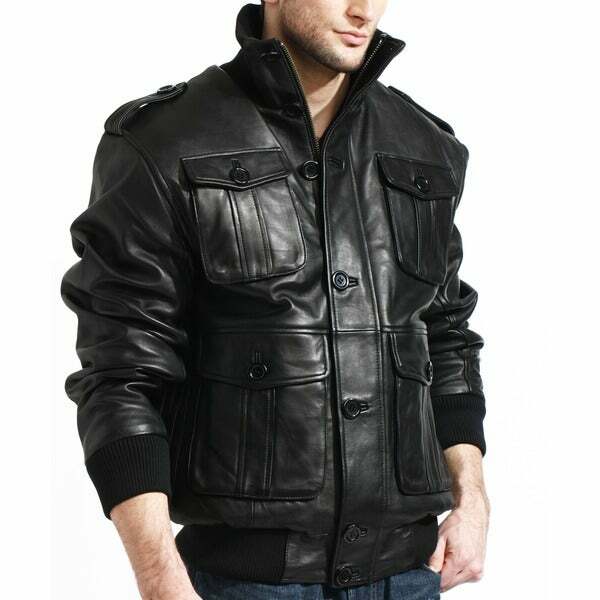 The jacket itself is top notch quality, very soft, heavy grade leather, the zipper is also a heavy duty grade for durability. The oversized buttons would make it easier to use with gloves on, but I don't use them personally. The size does run a tad small, so plan accordingly. Overall the price was a steal for a high quality jacket that I should happily be wearing still years from now. I gave this lambskin leather bomber jacket to my husband as christmas gift. He was very happy with it. He loves the quality and the warmth it gives. Absolutely amazing quality!! Exactly what I was expecting. Genuine lamb leather. Pulled it outta the box and the aroma simply verified the quality of this product. Extremely well packaged each button comes covered with paper to protect them and on top of all of it where scratch guard card board so you won't ruin the jacket when opening the box with a knife. 10/10 I would definitely recommend to anyone considering buying this. Order your true size or if you want a comfy fit one size above. I purchased this for my husband for an anniversary gift, and he is so in love with it. It is a very nice jacket, though it does run a bit small. I sized up and it's just right for my husband. The leather is soft and supple, and has a very cool vibe. Just what I was looking for. So soft! We had bought it for my son to ride his bike in, love all of those pockets! Not a regular bikers jacket though, more of a regular jacket for everyday wear. Bottom is looser so it hangs nicely. The jacket was very nice. The leather was soft and supple; it just wasn't what my husband wanted. We returned it. I gave this jacket to my husband for Xmas. He loved it!! The quality of the product is amazing for the price. Great find. "I'm 6 4 260 lbs with long arms. Usually wear 2xl need to know if go up to 3xl Will it fit or should go to 4 xl. Need this info prior to making order. Rick "
I would try the 4x to be on the safe side. "Hello,i weigh 167 pounds and i am 5 ft 10 inches tall,what size would you recommend? ?i like it to be roomy and some length,but not too droopy,im aware it runs a size small,so i need your help please?? ?thank you"
Based on customer reviews, we would recommend sizing up one size for your normal size. If you normally wear a size medium, we recommend trying a size large. I hope that helps. I order one and it came 2 days ahead of schedule!! Unfortunately it was way to large so I returned and purchased one of a more appropriate size! Great quality! "Can you list armpit to armpit in a large and medium?" Thank you for contacting us tonetheman. The measurements are as follows: M = 25 inches L = 26 inches Please let us know if you have any further questions.